Answer: Virga is just rain that never makes it to the ground. It’s quite common here in the desert southwest. 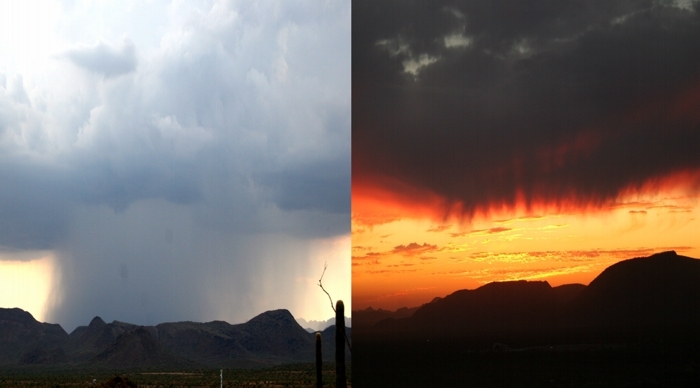 I shot these two photos, comparing “regular” rain to virga during our last monsoon season. The virga is on the right. On the left is “normal” rain making it all the way to the ground. All it takes to get virga is a layer of warm dry air underneath the rain cloud. And we have plenty of warm dry air around these parts. If the rain isn’t too heavy, and if the air it falls through is warm and dry enough, the rain simply re-evaporates before it hits the ground. This can also happen with snow, but that’s less common in the Southwest. You might wonder what happens to that H2O after it re-evaporates. Well, it just reenters the natural hydrologic cycle, returning to the sky as invisible water vapor, and eventually joining another cloud. The next time it rains, it might even make it all the way to the ground or ocean. I should remark on the color difference in the two images. The rain on the left occurred mid-afternoon, and was so heavy it acted like a opaque curtain for the sky behind. The virga happened near sunset, and took on the prevailing colors in the available light. I’ve seen “normal” rain do the same thing.